Forty-five seasons young, Reagle Music Theatre is back for another summer. Their three show summer season is kicking off with Kander & Ebb's musical of murder and mayhem, "Chicago." While most people are familiar with "Chicago" via the Oscar-winning 2002 motion picture, the sharp-edged show first came to the footlights in 1975. Director - choreographer Bob Fosse put his unique touch and style to the story of two merry murderesses vying for fame and fortune in the three ring circus of 1920's Chicago. With music by John Kander, lyrics by Fred Ebb and a book by Ebb and Fosse, the show is actually based on true stories and actual criminals featured in a 1926 play by reporter Maurine Dallas Watkins. Several of Kander and Ebb's glistening numbers have become standards including "All That Jazz," "Razzle Dazzle" and "All I Care About Is Love." In the story, Roxie Hart and Velma Kelly have both murdered lovers, separately, of course. Tossed in the slammer, they each hire the same flashy attorney, Billy Flynn, who promises to get them off. They long to make the front pages with splashy stories about their lives and their trials. Once free, they'll be primed to hit the vaudeville circuit and capitalize on their notoriety. This was life in the Roaring 20s. Originally starring Gwen Verdon and Chita Rivera, the show had intriguing staging (for the time) that found the musicians placed in a band box sitting high above the playing area. Below the bandstand, doors opened to allow for entrances and exits of both the actors and set pieces. 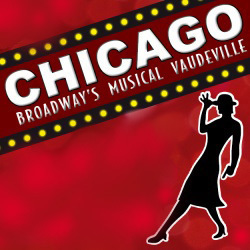 The official title of the show was "Chicago: A Musical Vaudeville," and the musical numbers and staging reflected the vaudeville style both in introduction and presentation. The show came back in 1996 when it received a concert staging as part of the Encores series at City Center in New York. While the original production featured full costumes and sets and a more traditional (although Fosse-esque) staging, at Encores, that was dropped for a more minimalist look. The Fosse choreography, of course, was recreated with all its pelvic thrusts and hip swivels. This short engagement was so enthusiastically embraced that the show transferred to Broadway, where it's been playing ever since. At Reagle, Angie Schworer plays Roxie (top, photo) and Sara Gettelfinger plays Velma. The premise of the evening is neatly rolled out in the opening number "All That Jazz" (sung by Gettelfinger, above), which both details Roxie shooting her lover and establishes the decadent debauchery of the prohibition-era lifestyle. While Schworer was a little hard to warm up to at the start, she soon became the one to watch, whether dancing with her "boys" or working hard to dupe the judge and jurors of her innocence in court. Prison matron-on-the-take Mamma Morton is played by Maryann Zschau, who does a nice job with the comical number "Class," a duet delivered with Gettelfinger (who Boston audiences will remember as Morticia in "The Addams Family" last year at The Shubert). As Amos, Rick Sherburne is Roxie's slob of a husband who initially takes the rap for the murder Roxie commits. It's unfortunate that the power of the band tends to drown him out in "Funny Honey," because his dialogue is crucial to setting up the plot. P. Mill has fun with the role of Mary Sunshine, the bleeding heart news reporter who's loyalty has the staying power of a gnat. Shining throughout the night is Rick Pessagno as Billy Flynn (above). He's both polished and appropriately superficial as the manipulating Flynn, singing great and scoring in both "Razzle Dazzle" and "We Both Reached For The Gun," which he brings to a heady climax. In the end, it's another fun evening at Reagle. "Chicago," at Reagle Music Theatre, 617 Lexington Street in Waltham, through June 23. Call 781-891-5600.